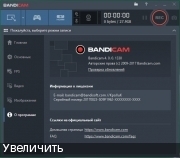 ·Applied new UI design for Bandicam 4.0. ·Added support for the "new Fullscreen" recording mode. ·Added support for the "Around Mouse" recording mode. ·Added the 'bdcam_nonadmin.exe' file which allows non-admin users (standard users) to use Bandicam without administrator privileges. ·Added support for text input in the drawing function. ·Added the "Get Started" menu for beginners. ·Added the Belarusian, Burmese language files. ·The mouse cursor/effect settings status is displayed on the main window. ·The microphone settings status is displayed on the main window. ·Improved the switching speed to Game Recording Mode. ·The maximum length of the format/size preset name is limited to 100 characters. •.Многие антивирусы реагируют на лекарство, поэтому для успешной установки они должны быть отключены. 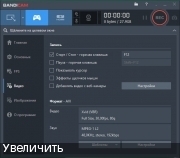 •.Если у вас выключен встроенный файрвол Windows, блокируйте программе доступ в сеть сторонним файрволом.